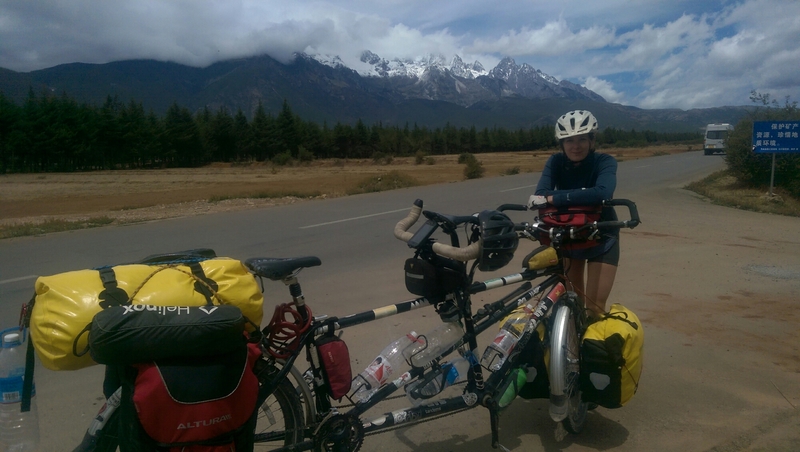 So the plan was to spend the time waiting for our visa extensions by cycling a 6 day loop around Lugu lake, north east of Lijiang. It’s meant to be a very beautiful place and is home to the last practising matriarchal society on the planet. We had a late start because despite the relatively early night, we (and by we I mean mainly me) was feeling a little delicate after our antics the night before… That rice wine is strong stuff! Anyway, the head was a little groggy. After a late breakfast/lunch we get going and cycle the long steady ascent up to Lugu lake. It’s a steady climb for about 20km and I’m not feeling the best, but at least we have the beautiful Jade Peak Mountain in front and a very strong and helpful tail wind behind us. The road is fairly busy with coaches who we assume are making their way to the mountain cable car. I decide I still need some music to get me through so blast out Urban Hymns, The Verve on the tandem’s stereo system… Thanks Richard Ashcroft, I needed that. At 1.30pm and having completed 20km we reach a toll gate. We have never had to pay at a toll gate before so we cycle up assuming we’ll be waved on through. We’re not. Instead we’re told we have to pay 320Y each!!!!! We laugh and explain that we’re not going to visit the mountain and we’re heading on through to Lugu lake (where we knew we would have to pay another 200Y admission fee). ‘You still need to pay the ticket to use this road’ says the woman. ‘if you don’t want to pay there is an alternative road to Lugu’. After consulting the map we see that this alternative route would add another 80km onto the loop around the lake – a days cycle basically – and we were already running behind schedule due to our late start. We pleaded but she wouldn’t budge. Taking stock of our options and considering carefully our overall China schedule we decide to turn back and cut the Lake from our plans completely. Both feeling disappointed (mainly because we feel we have wasted one of our 60 precious days in China) we turn the bike round and head back down the road to Lijiang. It’s down hill but the now gale force wind is right in our faces, blowing us across the road… Paddy is cursing at his phone because he’s managed to lock the language OSM map permanently into Chinese. As we battle with the elements I manage to check the Lonely Planet guide on my phone kindle app for the bus schedule from Lijiang to Tiger Leaping Gorge. The last bus would leave at 3.30. ‘We can try and make it’ yells Paddy over the howling wind from the front. We had an hour and a half to cycle the 20km back to the hostel, pack for the two day hike, explain to our non-English speaking host that we needed to leave the bike and most of our bags there, and find a taxi to take us to the bus station. It would be tight. At 3.25pm we’re sitting panting in our seats on a bus heading to Quiatou. After a mad dash, we had made it – just! We were on our way to hike the famous Tiger Leaping Gorge. The day wouldn’t turn out to be completely wasted! P.S – there was also another bus which left at 6pm…. P.P.S – we managed to miss our stop on the way up and found ourselves 30km further up the road than we needed to be… Luckily our nice bus driver flagged us down another bus and we got there in the end!